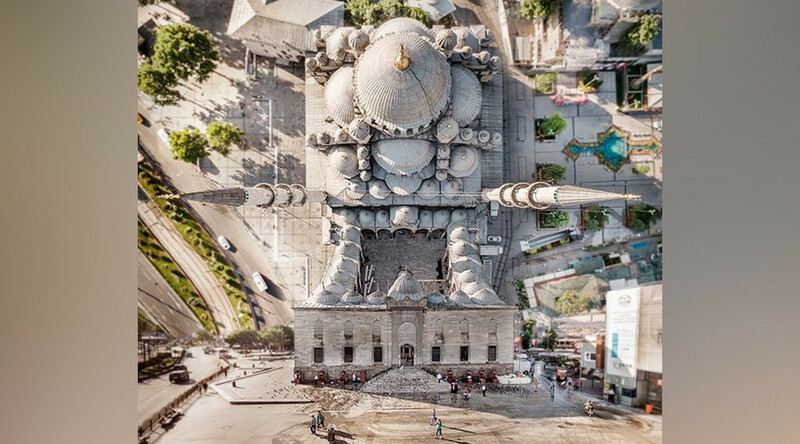 A Turkish photographer is playing fast and loose with the fabric of physics, bending city streets in a series of manipulated images that will baffle and hypnotize you. But those who are easily queasy might not want to stare for too long. Each image is incredibly disorientating, with buildings looping upwards where the sky should be and roads taking a somewhat vertical route. Aydin Buyuktas’ artistic images are part of his ‘Flatland’ project, aimed at providing the viewer with a “multidimensional romantic point of view”. The Ankara-born artist used a drone to take aerial photographs, before splicing them together with images taken at ground level. One image sees Fenerbahce’s home football stadium being folded as if it was a piece of paper. The distorted images have been compared to scenes from dream-jumping Hollywood blockbuster Inception, which blew audiences away with shape-shifting cities and left many scratching their heads. A previous project by Buyuktas - ‘Parallel Universes’ - also turned the world on its head with a series of topsy turvy photos depicting inverted cityscapes and mind boggling motorways of the sky.